The Adelphi Theatre on The Strand, London is the fourth building on the site, having originally been founded in 1806 as the Sans Pareil by merchant John Scott and his daughter Jane. Together they gathered a theatrical company that was the host of many plays, musicals and pantomimes. In 1819, the theatre reopened under its present name, where many of Charles Dickens' stories were adapted for the stage including Nicholas Nickleby. The old theatre was demolished and reopened in 1858 and again, a third theatre was opened in 1901 where it was the host of productions such as The Earl and the Girl in 1904. The Adelphi's present site opened in 1930 on The Strand, close to many of London's top hotels, and was redesigned in an Art Deco style by Ernest Schaufelberg. The theatre continued to host plays and musicals, and in 1993 Andrew Lloyd Webber's Really Useful Group purchased the Adelphi and refurbished it. 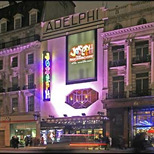 The Adelphi was the original hosting of the American musical, Chicago, having played there from 1997 until 2006, when it transferred to the Cambridge theatre. The most convenient Tube stop to reach the Adelphi by is Covent Garden on the Piccadilly line, which is just 400m from the theatre's entrance. However, as this station can get very crowded at evenings and weekends you can opt to walk to the theatre from Embankment instead, which is serviced by the Northern, Circle, Bakerloo and District lines. The nearest mainline train station is Charing Cross, which is fortunately also located nearby to the theatre and is also reachable on the Bakerloo and Northern lines. Step free access is available into the Stalls via the main entrance on The Strand. There is a slight slope from the back of the Stalls to the front. Infra-red systems with headsets available from the cloakroom. Please note there is no induction loop system in the auditorium for hearing aid users. There is an induction loop at the Box Office to assist hearing aid users when booking and collecting tickets. Access Dogs are allowed inside the auditorium and can remain with their owner The theatre management are happy to look after your Guide/Hearing dog during the performance. Please approach a member of the front of house team when you arrive at the theatre and they will make the necessary arrangements.